Home Grilling Basics What is a Chuck Eye Steak? If you were to pose the question, “what’s your favorite steak?” to 50 people, you’re likely to get a pretty even split of those who say ribeye, strip, filet, or a combination (t-bone or porterhouse are, in fact, strip and filet). 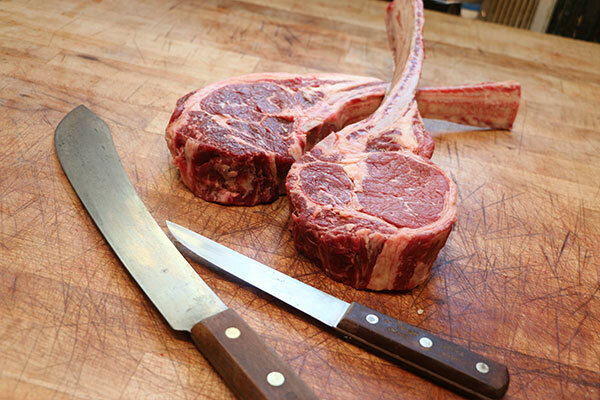 You might even hear some say they prefer a tomahawk which is a bone-in ribeye that has gained popularity not only because the steak is incredible, but because of the impressive and grandiose presentation that giant bone offers. What you likely won’t hear is mention of the chuck eye steak, or the even more rare 5th bone tomahawk that I have been getting from my local butcher, The Organic Butcher of McLean. 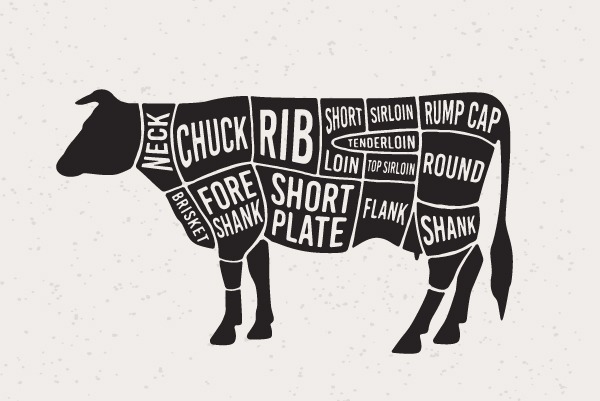 So, what is a chuck eye steak? The chuck portion of the steer is the section of meat in the shoulder area above the animal’s front legs. It’s a working muscle with little fat resulting in a cut of meat that’s on the tougher side. Chuck is often ground into burger because of the great flavor; grinding it into burger detracts from the toughness of that working muscle. The chuck eye, is the last cut off the chuck portion of the steer, from the 5th rib (ribeyes are cut from ribs 6 through 12 of the steer). So, given the proximity to the ribeye, the chuck eye is very close to the taste and tenderness of a ribeye. It comes with the intense beef flavor you love from the chuck, but is infinitely more tender than a typical chuck steak—though not quite as tender as a ribeye. Often referred to as “the poor man’s ribeye” the chuck eye steak provides some serious value, what you lose in taste and tenderness, you gain in the bank. The chuck eye steak is typically $4 to $6 less per pound than ribeye. It is a harder cut to find as there are only two of these cuts of meat per steer and the trade-off for the value usually has them go quick at the butcher. Now, what’s a 5th bone tomahawk? Well, the guys over at Seven Hills have figured out a way to cut the chuck eye steak while preserving the giant 5th rib bone that has traditionally been discarded as part of the processing. This allows a steak that is not only very close in quality to the ribeye, but one that can present like the king of steaks—the tomahawk ribeye—at a price point that won’t have you eating ramen noodles the rest of the month. (Not that I have anything against ramen noodles, I’m certain I’ve eaten at least a couple thousand of those little bricks of goodness in my day). I digress, when seasoned and cooked properly, these steaks are well worth the money. What’s more, their lower fat content just gives all the more reason to baste them with some compound butter during the process with no guilt! Or take it up a notch with some authentic chimichurri sauce for an old school crowd favorite.